What Makes a Successful Eclectic Room? What makes a space successful & memorable? This brave use of color & contrasting textile prints in this space is very effective. At first this seems to be an unlikely choice of blend of colors, but it just works in such an evocative and sophisticated manner. The Parisians tend to have much more of an innate sense of how to blend textures, patterns & colors. I find that when Americans try to recreate that French feel they often fail, the overall ambience of the room is compromised and just misses that certain something. There is no soul in the space. In most cases it is because they become too matchy-matchy. The designer is too concerned with colors and patterns clashing that they play it safe and use the same flat color in repeat mode throughout the room on every surface & decor item. They may add an extra complementary color for some contrast but the room will still look flat. The room should look like it has been put together over time. The most successful spaces usually have a few statement pieces that vary in either age, texture or print to add some interest and soul. An unexpected piece/s which both clashes and matches at the same time is what I find to be the genius of a room and ties it together. This is the divide which distinguishes the good designer from the great (and memorable) designer. The designer who has the eye for distinguishing what that hero piece should be for that space, that fine line (which is a fine art) between a clash that works and a clash that fails. The success of this room is in its history and its bravery. It is unapologetic in its expressiveness. You can sense the adventure that took place in this owner's lifetime and their curious personality. The collection of loved wonders such as the chinoiserie pieces, Moroccan lanterns & artworks all work in collaboration to create a soulful space. It is obvious that this is a room to be lived in and not just for show. Oberto Gili, celebrated photographer of houses and gardens, had always dreamed of living off the land. Born and raised in Turin, Gili spent childhood summers at his grandfather’s big farm in Bra, where he tagged along with the hired hands for much of each day, he says, “coming home for lunch and then running back to them.” His extended family still calls that countryside home, and the photographer and his companion, Joy Sohn—herself a gifted photographic chronicler of domestic settings—now live there, too, on about six acres that abut family members’ properties. “It’s better than having other kinds of neighbors,” says Gili, whose latest book, produced with writer Marella. Love how this interior is very fresh, light & open while still having character and an encompassing aesthetic to tie it all together. Touches such as painting only the inside of the door frame are a clever way to add a subtle splash of color without overwhelming the space. It still reads as a white interior, but it has layers of richness and frivolity which makes it memorable. 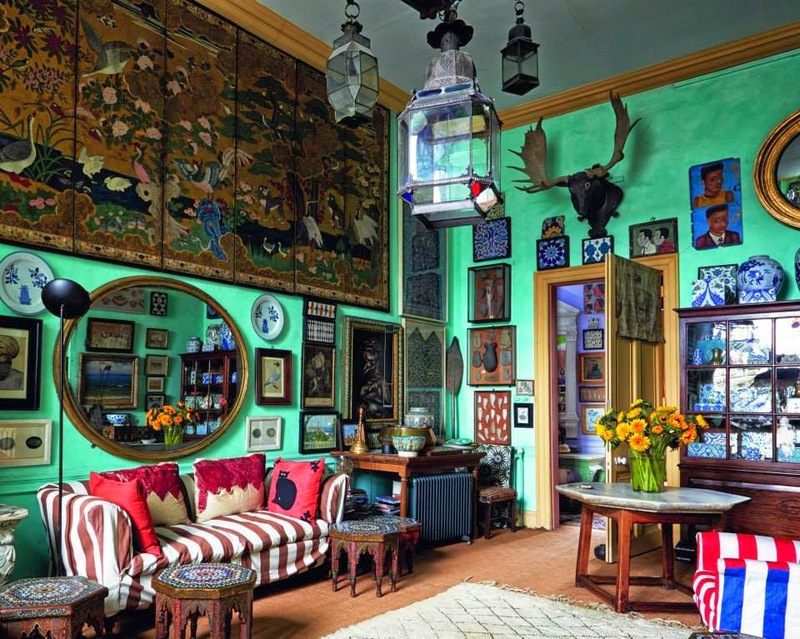 This Belle Époque townhouse owned by Leo Coolen and Susan Theunissen reflects their business, ‘Sprookjhes’ (Fairy Tales), a company that loans decorative items to directors and decorators. Coolen used to be an antique dealer. “There came a point when I grew tired of all that brown furniture.” Despite the numerous playful collectable items, the interior remains uncluttered and livable. This is a great example that shows you don't need to have a million bucks to have an interesting space. The extensive wall of religious iconography is a concept that can be reproduced with many different objects & themes. One photo or chatchka item on it's own may not have much impact, but as a collection they create a textured feature wall. The use of a vibrant, contrasting throw blanket to cover an old sofa is another quick & elegant fix if you can't afford that dream sofa (yet). I think it is wonderful that this person has found a way to express themselves through their home within their means. It has more soul than many homes I've seen with million dollar fit outs. Top 10 Favorite Paradis Maison Room Fragrances!